A continuous line yes. but it does clearly cross the panzer afrika icon. Sorry shrinky, but on this one i hate to say you're incorrect. *this is a great map by the way, probably my favourite ... wish the other two that were supposed to make up the trilogy were in development, was really looking forward to the one with the aussie desert rats. On closer look, i admit that i made a mistake with the map reading. It passes through panzer africa but just like a passer-by sort of thing. is there any way this can be like clear cut? As in the line clearly goes to panzer africa and then from there goes to 21st panzer. Shrinky wrote: On closer look, i admit that i made a mistake with the map reading. A "passer-by sort of thing"?? If it wasn't mean to connect, it wouldn't even get close to even touching Panzer Africa. It's more than clear imho. if u look at it, u will see that the line passes by on the left of the army circle. Not exactly clear cut. Shrinky wrote: if u look at it, u will see that the line passes by on the left of the army circle. Not exactly clear cut. Shrinky, i think you grabbing at straws. If several other people come in here and make the same complaint then i will amend it, but for now no. and I doubt anyone would come and point this out so late. i came right now only because i hadn't played it earlier as yet. Anyways suit urself and keep the map as it is. I will live with it. I mortared an area and annihilated it but would not take it...I got cheated how is this fixed? Yeah... that would be bombard, which is different than one way attack. bombard can reduce the number of the opposite enemy and reduce them to neutral. A one way attack is like bombard except you actually take the territory after defeating all of a player's men there. sorry for that remark....I was being sarcastic...but I realize sometimes on posts it can be taken wrong. Why are all the little Italian flags on this map backwards? the flags in the legend are set at the correct position for reading....i.e. left to right, with the poles situated on the left. In the map, some are reversed to give the appearance of movement making them flow behind their flag. this was done after a suggestion from the punters, but i think it would look silly for some of the other flags to fly in reverse. i was just playing this map and i was thinking it would be interesting to make the objective achievable. right now the objective means holding about 90% of the map which is kinda hard to do. i don't know if it's worth changing the map for this just giving my 2 cents. DiM wrote: i was just playing this map and i was thinking it would be interesting to make the objective achievable. right now the objective means holding about 90% of the map which is kinda hard to do. The Axis actually defeated the Allies in this battle to capture Tobruk, and the Allies forced to flee to Egypt. Essentially there are two sides to this battle, and as such it's probably best for 1V1, doubles, quads. 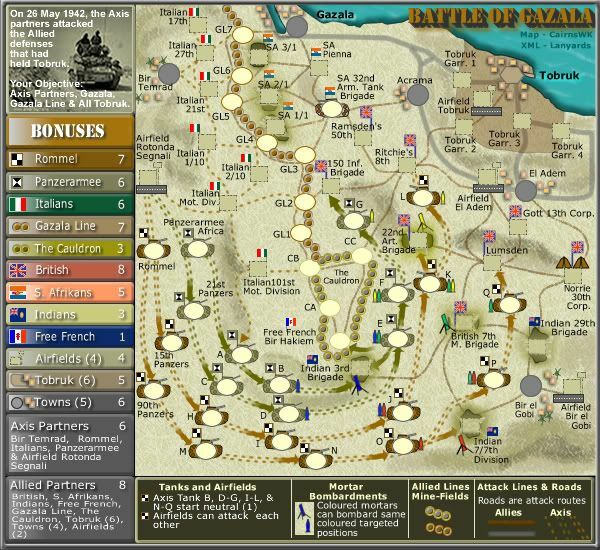 But from the viewvpoint of the Allies, it would be necessary to defeat the Axis partners while holding Tobruk. From the viewpoint of the Axis, they'd want to destroy the Allies. So i doubt that holding anything less than the current objective would suffice in order to be true to history, but i don't deny it's a high objective. Also i've had a game where i won because i destroyed my enemies before the objective was achieved, so thus the objective then becomes obsolete but enemy still destroyed. I wouldn't want to change the map, but i think the objective is achieveable. yeah of course that judging from a historical point of view the objective is accurate but the thing is that in 3-8 players it's impossible to take it unless you own the entire map, in which case you've already won with or without the objective. and in 1v1 where it should be easier it's actually kinda a bad move to go for the objective because basically you'd have to kill a lot of neutrals. in my opinion objectives should be an alternative way to the classical style of winning which is by sheer accumulation of terits. yes the objective is achievable but it's the same as winning in a classical fashion. you'd still have to be by far the strongest player on the map and completely dominate the opponents. haven't you just answered you own question about what an objective should be? One of the greatest maps__ Figures that cairnswk made it. BTW - I haven't followed the convo close - But I'm against an objective for this map if one is being proposed. I think it's good not to mess with an already great formula. cairnswk wrote: haven't you just answered you own question about what an objective should be? yes i did, that's why i'm saying this objective isn't. on this map if you go for the classical way of winning which is through total annihilation of your opponents or if you go for the objective it's the same. there's absolutely no difference. it's like making the objective to hold the whole map. in some instances (mainly 1v1) it's even harder to hold the objective than to kill your opponent. in other objective maps you can win via objective even if you're the weakest player thus making the objective an alternative to the classic annihilation. but, again, it's probably not worth changing the map. ViperOverLord wrote: One of the greatest maps__ Figures that cairnswk made it. I'm very sorry to inform you, but there is already an objective on the map, even though you may never have used/seen it. So it is there, but play can render it obsolete. I say the objective is, even though it is only 45 of the 70 terrs (64% - I just counted them), which is consistent with what history might have required, as i explained above. It is possible to obtain the objective, it is also possible to have classic gameplay by annihilating you oponent, and it is possible to conquer the whole map if you wish. I've played 3 1v1 games and only won 1 - where 49/70 regions were held - but i anniahlated my opponent on that occasion. And yes, at only 64% percent of terrs required for objective, i'd be most unlikely to change the objective.